Unique and affordable, this atomic clock is equipped with the same precision and accuracy as our other ExactSet clocks. It is perfect for use at home or the office, uses signals from the U.S. Atomic Clock to set itself and even adjusts for daylight saving time. 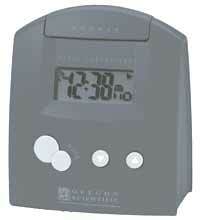 It has two alarms, a time/day display and a low battery indicator. The alarm has an 8 minute snooze. Actual size: 3.5" x 2.2" x 4.2"